My card uses a white card base with a purple layer. 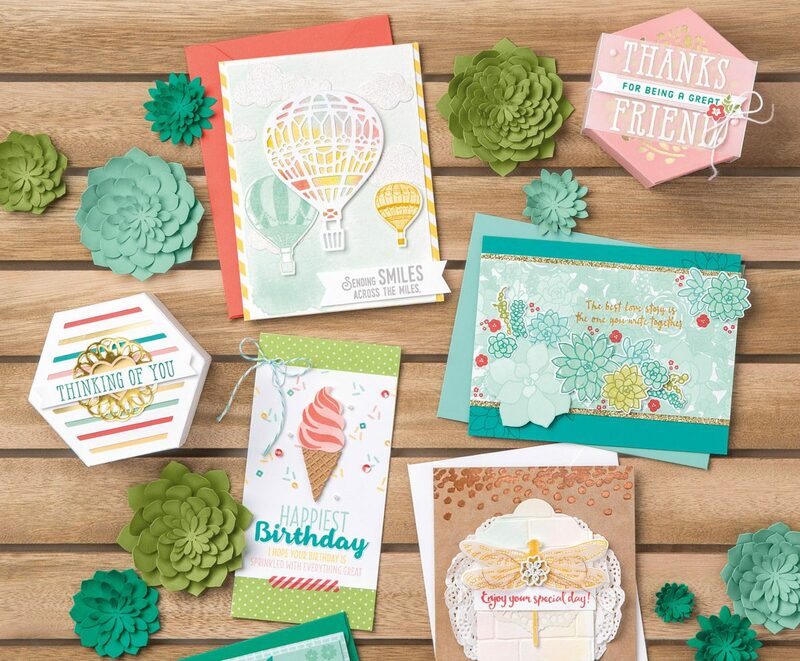 The Designer Series Paper is from the Delightful Daisy pack which will be retiring. I used the Celebrate You thinlets (which will be carrying over to the 2018-19 annual catalog) for the Amazing die cut which is in Calypso Coral. The leaf die cuts are from the Petals and More Thinlets which will also carry over . I did use some vellum die cut leaves from the Wildflower Wishes paper pumpkin (you can always cut your own or leave out). I stamped Amazing on the lower half and added the You tag. Silver metallic thread and pearl and coral embellishments were also used. Please join us every Tuesday as we case the catalog. Thank you for joining me on my blog this Tuesday. Today’s card is almost an exact copy of a card shown on page 94 of the Annual Catalog (the pink square card). The only thing I changed was the color. As you can see, I used Tranquil Tide, a beautiful new in-color. Here is my card and below it a picture of what the catalog card looks like. For my card I used a set from the annual catalog called Floral Phrases (page 95) for the stamping down the sides of the DSP panel. 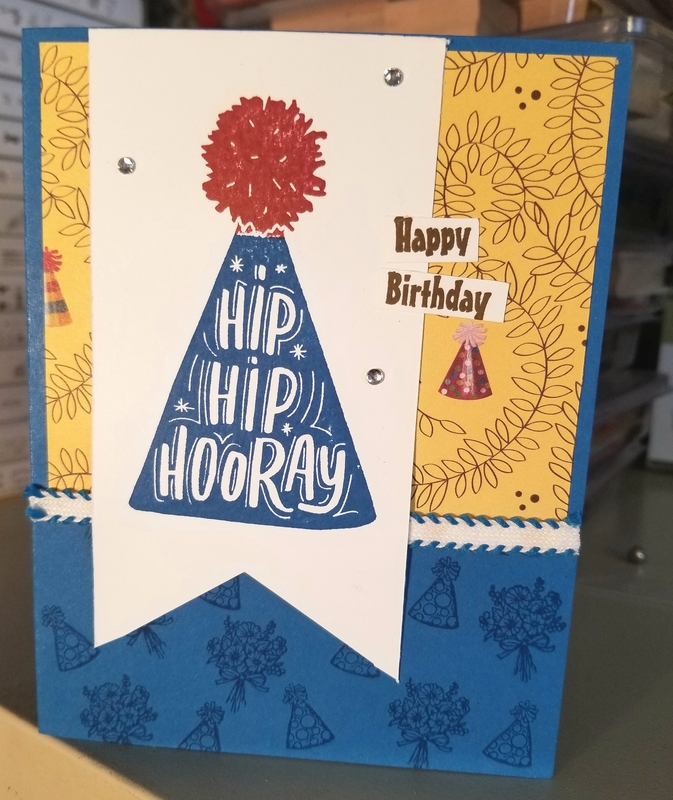 For the greeting, I used a stamp from the set Perennial Birthday, which can be found in the Occasions Catalog on page 16. I also used a greeting from that set for the inside. I used several other products from page 95 of the A.C.. The DSP is called Fresh Florals Designer Series Paper Stack and has prints using all the 2017-2019 in colors. I used a bow from Bitty Bows and a new punch in the annual catalog called Starburst for the round greeting accent. That’s it for this quick and simple card. Please join us on the Facebook page CASEing Tuesday and share your version of a card we CASE each week from one of the current catalogs. You do not have to blog about it. Just a reminder that Sale-A-Bration is still going on until the end of March. You can earn free products for each qualifying order. It is also a great time to join Stampin Up as either a hobby demo (enjoy a great discount) or a regular demo. You will receive two extra stamp sets in your starter kit, which is already a great deal. Contact me for more details. If you would like to order any products, I would love to be your demonstrator. Here is a link to my on-line store darleneseitz.stampinup.net Please use the following Hostess Code when ordering and receive a free gift from me. ZVGAXGEA (do not use on orders over $150, before tax & shipping, you will receive your own hostess rewards and a free gift from me). Sorry I have not posted the last couple of weeks but here is this week’s card. I changed it up some by adding more layers and color, plus placed the items a little differently. I also added rhinestones. The card uses Petal Passion Suite products found on page 23 of the Occasions Catalog. The stamp set and dies can be purchased as a bundle and you can save 10 %. The wood mount product code is 145973 and clear mount is 145974. I also used the Petal Passion DSP and added color with the Stampin Blends. I used basic black, melon mambo and whisper white card stock. Thanks for visiting my blog and happy crafting. Discovered this never posted! Here is last week’s card. It is based off the card shown on page 42 of the Occasions Catalog. See below for a picture of both. I used basically the same concept but different colors and stamp set. I used the Bird Banner stamp set for the main focus (Bird & greeting). I used the Stampin Blends for the coloring. I also used Woodgrain DSP, an embossing folder for the Melon Mambo banner, Powder Pink ink for the “Thank You” on the white banner, Triple Banner Punch for the bottom of the banners, white twine for the bow, Stitched Framelits for the circle, and coordinating sequins as embellishments. I cut the Bird out by hand and popped it up on dimentionals. If you would like to buy any of the products used to create this card, go to my on-line store at darleneseitz.stampinup.net. Sale-A-Bration is still going on and for each $50. order, you can receive a free product of your choice from the SAB Catalog. SAB is also a great time to Host a workshop or join Stampin Up. There are additional perks as well. I hope you have enjoyed this weeks card and will join us on the Facebook page CASEing Tuesday. Here are my cards for this week. I guess I really liked this design because I made four cards using it for this week (and I worked a lot this week for my outside job). I was in the mood to craft. Here are the cards. And here is the card from the catalog. As you can see, I changed some small details on some of the cards and added some bling. The sets I used are (in order of pictures): Color me Happy (still available), Seaside Shore, Feathery Friends (hostess set), and Daisy Delight. All these sets are current and can be seen and purchased in my on-line store. Here is the link darleneseitz.stampinup.net. Don’t forget Sale-A-Bration is still going on until the end of March (=free products). Contact me for more details or any stamping question. Darstz@hotmail.com. Today I am sharing my #CASEingtuesday131 card. It is based off the card in the Occasions Catalog on page 4. See below for both cards. I changed the shape of the card, added an extra layer and some embellishments. I wanted to go with a Valentine’s theme so I used a carryover set from the last Holiday Catalog called Festive Seasons (page 45 of the 2017 Holiday Catalog) . It can also be found in my on-line store. It is a multi season set that can be used for Christmas, Halloween and Valentine’s . I also used a set we have in the Annual Catalog called Bloomin’ Love (page 88) which is very popular and can be used for Valentine’s or all year long. I also used Real Red, Blushing Bride inks and cardstock (page 186 of annual catalog) along with Whisper White cardstock (page 194 of annual catalog). I included some embellishments, Metallic Enamel Shapes and Enamel Shapes both found in the annual catalog on page 196 (and in my on-line store). The flower used is not current but can be replaced with anything appropriate for the occasion. Please check out the Facebook page CASEing Tuesday and join us each Tuesday. You do not have to blog to participate. Thank you for viewing my blog and if you would like to purchase any of the products, please visit my on-line store at darleneseitz.stampinup.net or contact me at darstz@hotmail.com. Darlene Seitz, Independent Stampin Up demonstrator. 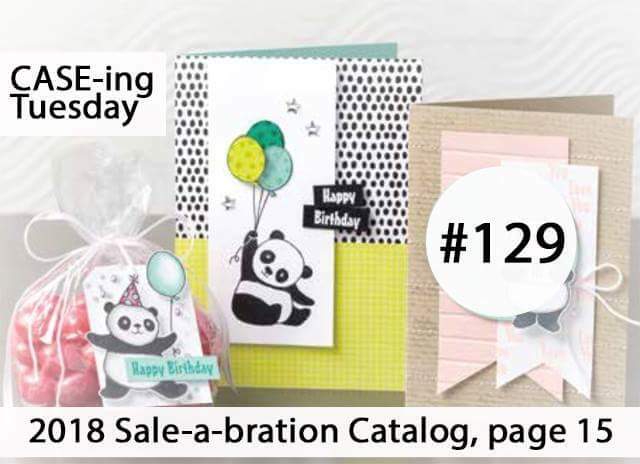 Today’s card is based on a card in the SALE-A-BRATION Catalog on page 15. See both cards below. I used the Birthday Memories DSP and Pacific Point card stock. I used three stamp sets. Birthday Delivery from the annual catalog (the bouquets and hats on the bottom of the card), Celebration Time (big party hat) also from the annual catalog and Party Panda (the greeting, Happy birthday) which is FREE with a qualifying purchase. It is found in the SAB catalog. I also used 1/4 ” edged ribbon (Pacific Point). These products can be seen in my on-line store at darleneseitz.stampinup.net. Don’t forget the occasions catalog and SAB are going on right now. SAB is the biggest sale of the year for Stampin Up. Earn free products now through 3/31/2018. Contact me today for catalogs or details of the sale.